As Gus so aptly pointed out, most of my "recent" entries have started with "I know it's been a long time..." Yes, I have once again fallen off the blogosphere. And once again I reemerge, hopefully to stay. Back in September 2012 I lined up several projects. I'm happy to say, I have FINALLY finish some of them. Here is the first: the Lisette Traveler Dress. 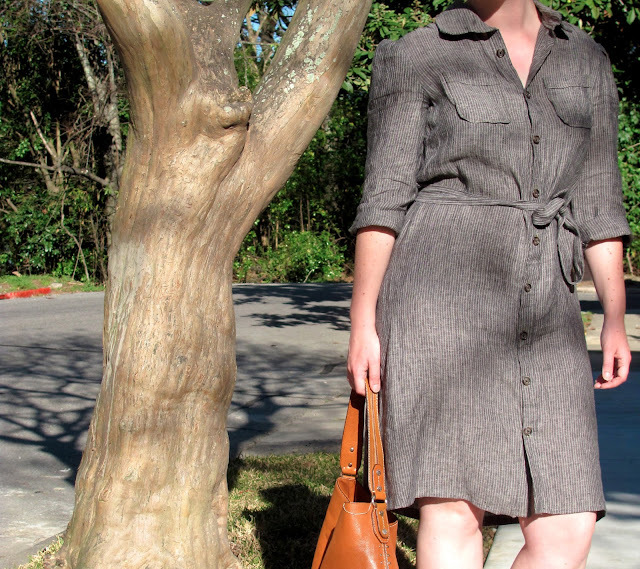 I made this shirt dress primarily for work. I've worn it several times, and it performs wonderfully. My first graders were full of compliments. The soft linen fabric does wrinkle a bit, but nothing a little starch can't fix. This photo also shows our awesome new baby blue front door with stained glass! 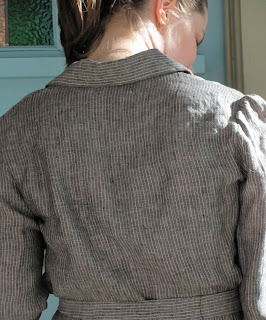 Here you can see the gathering on the sleeve - a feminine touch that is absolutely necessary for me when using this masculine brown stripe. I have the tendency to look a little man-ish if I go with straight menswear shapes. 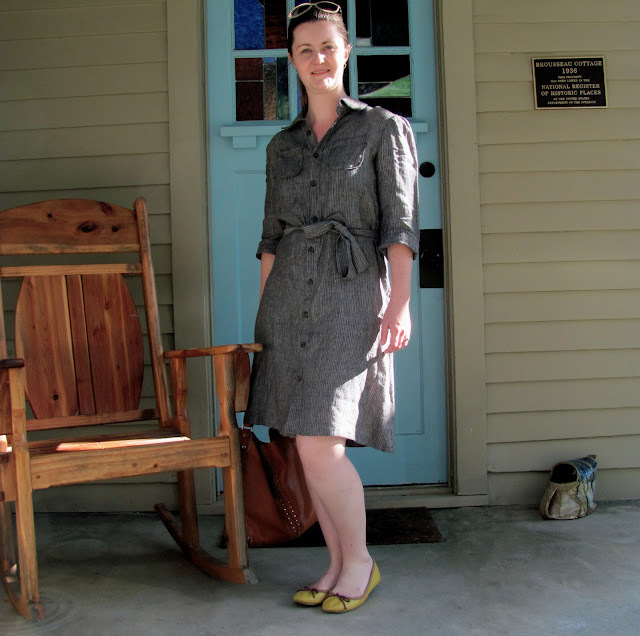 I may try this dress again in a fabric that doesn't wrinkle. It would be great for traveling (as the name suggests.) I'd love to throw it in a suitcase and go. This version works okay - most hotels have an iron for post-suitcase straightening out. It's comfortable, long enough, and can be worn with heals or flip flops. Other belts work nicely as well. What's your favorite travel outfit? That's lovely fabric choice for the dress, looks so comfortable to wear yet chic! I haven't made this yet despite being one of the first patterns I bought because I haven't found the right fabric for it yet. Oh, and congratulations on the announcement in your last post! Thank you, Janey! 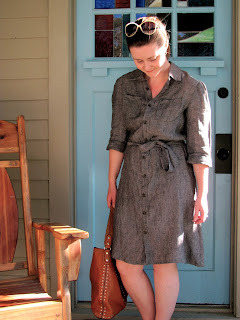 This is a great shirt dress. They don't always look right on me, so I'm happy I found this pattern. Oh, this is so cute on you! I've also had this in my stash for the longest time (it was maybe the second pattern I bought), and this is more encouragement to sew it! Thanks, Ginger! I highly recommend the pattern. Definitely a make-again for me.